Origin and Habitat: Hawortha pumila (a.k.a. Haworthia margaritifera) is possibly the Haworthia occurring closest to Cape Town particularly around Worcester, Robertson, Ashton, Bonnievale, Montagu and Drew, Western Cape, South-Africa. The plant occurs in a winter rainfall area , which experiences mild frost, -2°C. Summers are hot, up to 44°C. Rainfall varies from 150 mm (Worcester area) to 350 mm (Montagu area). It is not endangered. Habitat and ecology: The plant occurs in Karroid Broken Veld vegetation, pollinators include bees, moths, bumble bees, the Malachite and the Lesser Doubled-collared Sunbirds. 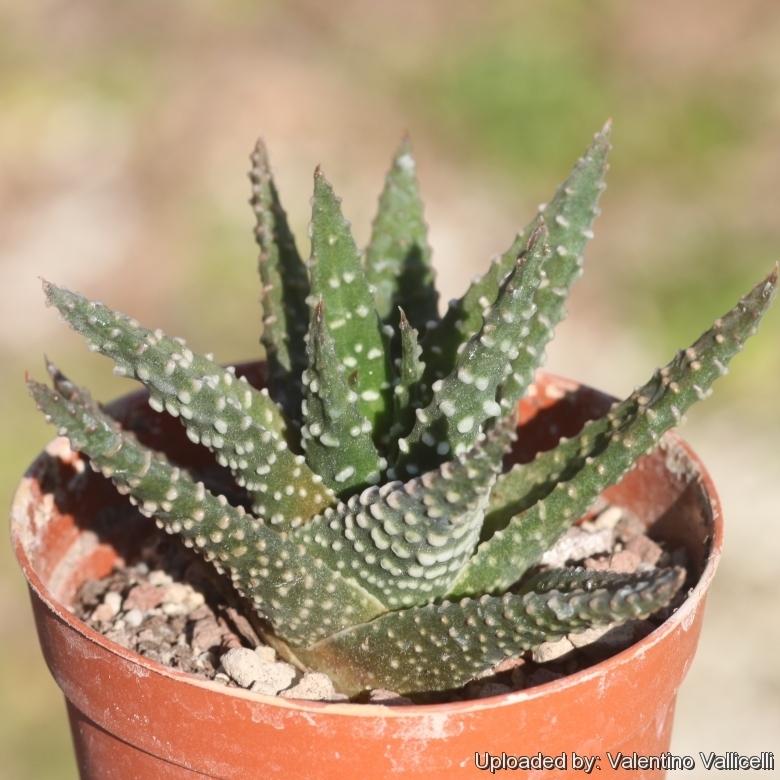 Description: Haworthia pumila (a.k.a. Haworthia margaritifera) is one of the most impressive and eventually large species of the genus easily distinguished by its slender, pointed leaves with white tubercles, which in some cultivars may be dough-nut shaped. It is one of the larger Haworthias, but slow growing and will take years to reach its mature dimension. Habit: The plant is a succulent that looks like a miniature aloe. The plants live for about 30 to 40 years if they are cultivated properly. Rosette: More or less stemless, compact, up to 15 cm across and 25-30 cm tall. Leaves: 7-14 cm long about 2 cm wide at the base, triangular-ovate to broadly lanceolate, upright and incurving, dark brownish-green, both surfaces prominently covered in large white tubercles in indistinct rows, and particularly conspicuous on the underside of the leaf surface. The tubercles are more or less round and raised. Inflorescence: The flower spike is approx. 400 mm tall. Flowers: Somewhat larger than in other species, greenish to brownish-white in colour and waxy in texture (usually Haworthia flowers are white, not in this case). Booming season: Early summer. Seed ripens in autumn. It grows relatively slowly from seed and it takes about 5 years for a plant to reach flowering maturity. Notes: The hybrid genus x Astroworthia Rowley contains hybrids between Astroloba aspera and Haworthia pumila and occurs naturally in the wild in South Africa. 11) Germishuizen, G., Meyer, N.L., Steenkamp, Y. & Keith, M. (eds) “A Checklist of South African plants.” Southern African Botanical Diversity Network Report No. 41. SABONET, Pretoria.2006. 12) Bayer, M.B. 1999. "Haworthia revisited. A revision of the genus." Umdaus Press, Pretoria. 13) Bayer, M.B and van Jaarsveld, E. 2001. ”Haworthia. in Illustrated Handbook of Succulent Plants: Monocotyledons.” Springer, Berlin. 14) Mottram, R. 2000. “Haworthia pumila, margaritifera, or what?” Haworthiad Vol.14(1)22-24pp. Cultivation and Propagation: Haworthia pumila are of easy cultivation and relatively low maintenance, which makes them a good houseplant, and can be excellent subjects for the beginning succulentophile (they can grow easily on window sills, verandas and in miniature succulent gardens where they are happy to share their habitat with other smaller succulent plants, or in outdoor rockeries). Growth rate: They are relatively slow-growing plants that offsets to form small clusters with time.